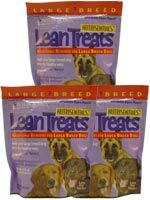 Nutrisentials Lean Treats For Large Dogs 10oz Bag Pack of 3 are nutritional rewards for dogs to keep your dog trim the healthy way! Nutrisentials Lean Treats For Large Dogs 10oz Bag Pack of 3 are nutritional rewards for dogs to keep your dog trim the healthy way! Made with real skinless chicken, these treats are cut into bite-sized pieces for proper portion control. A fun and tasty low-fat way to help your best friend maintain a healthy weight. Comes in a 10 oz resealable bag.